Leopold Harris (Lewin Hirsckowitz) was born in 1836 in Loebau, Prussia. He was well educated in Prussia, and spent time throughout his life reading and studying in his spare time. Harris arrived in America in 1852, at the age of sixteen. Leopold Harris first settled in Louisville, Kentucky, where his brother resided, but soon thereafter headed West. He engaged in a number of business ventures in San Francisco, San Gabriel, and San Bernardino. Harris became a United States Citizen in 1857. In the early 1860’s, Leopold Harris decided that Los Angeles offered better business opportunities. 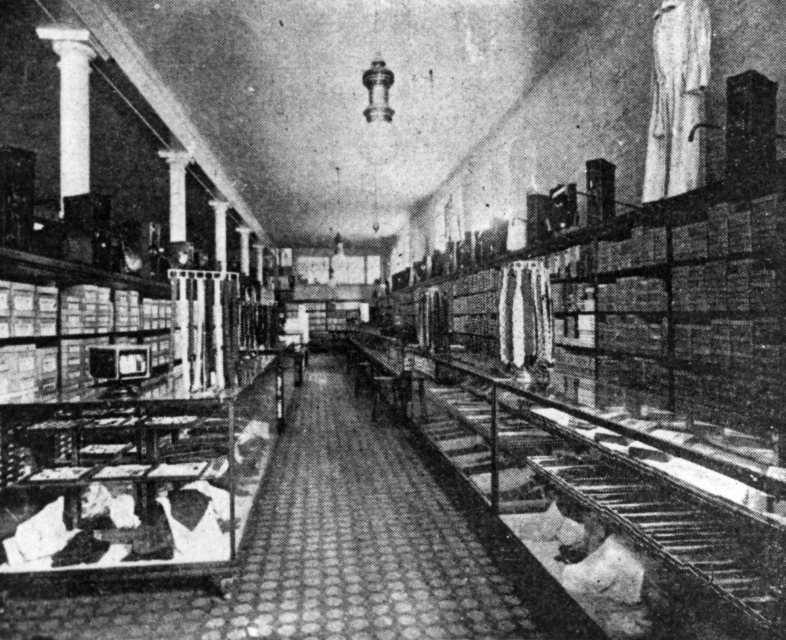 In 1870, he took over a Main Street stationary store, which had been operated by Herman W. Hellman. 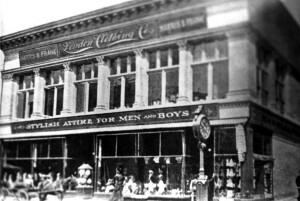 In the 1880’s, he established a retail men’s clothing firm known as Quincy Hall Clothing Company, and later as London Clothing Co. 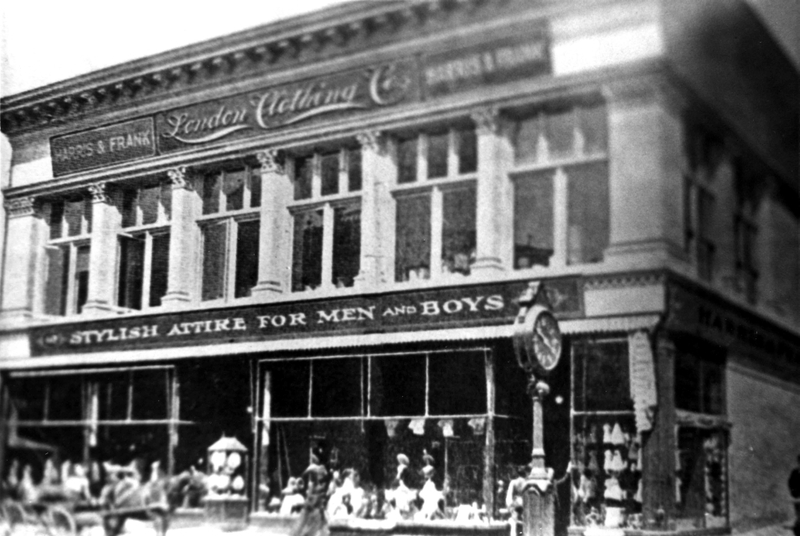 He also operated a wholesale menswear company called L. Harris & Co.
Harris was the first merchant in the city to establish a line of credit with New York clothing manufacturers. His retail firm’s name became Harris & Frank when Herman W. Frank, a highly trusted manager within Harris’ business, married Harris’s daughter. By 1903, Harris’ two sons-in-law, Herman W. Frank and M.C. Adler, and his son, Harry L. Harris, were running the business. 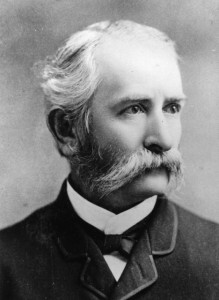 Leopold Harris was the first in Los Angeles to erect buildings on long term leases, among those being the Allen Block, which he built in 1885 at the corner of Temple and Spring Streets. In 1887, he secured a twenty-year lease on Spring Street lots and built the Salisbury Block. 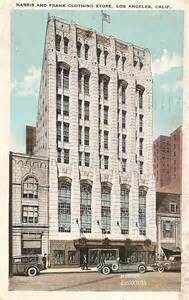 In 1898 he built the Harris & Frank Building at 437 South Spring Street, near Fifth Street. He also made investments in sheep, which turned out to be a good stroke of business. Leopold Harris served as an officer of B’nai B’rith Congregation. Harris gave generously to various city charities — both Jewish and non-Jewish — but in such a manner that, not until his death stopped his support, did anyone other than those directly concerned know where the money was coming from. In 1868, Leopold Harris married Minna Jastrowitz. They had four children: Mrs. H. W. Frank, Mrs. M. C. Adler, Mrs. Alfred Stern, and Alfred Harris. Leopold Harris passed away in 1909, as he returned from an extensive trip on the European continent. Norton B. Stern, “Herman Frank and Leopold Harris,” Western States Jewish History 41/3. Norton B. Stern, “Leopold Harris,” Western States Jewish History 41/3. William M. Kramer, “Leopold Harris 1836-1910,” Western States Jewish History 42/2&3. Herman W. Frank, Scrapbook of a Western Pioneer (Los Angeles: Times-Mirror Press, 1934).